June 15, 2018 – During my t ime in the hot tub industry, I’ve had the good fortune to be selling Hot Spring Spas, which arguably has the best reputation and is still the best-selling brand of hot tub today. As good as any brand of hot tub might be, and how much folks love hot tubbing, there’s always been one Achille’s Heel—the cover. There’s a lot of resistance with hot tub owners to grasp the fact that a vinyl hot tub cover is the weakest link. Many things contribute to vinyl covers having a limited life: hot water and chemicals attacking the underside of the cover, UV and all the elements wreaking havoc on the exterior, mold and/or mildew breaking down seams and stitching. Ultimately, the cover becomes waterlogged and heavy, and needs replaced. The industry standard for replacing a hot tub cover is very 3-4 years; if you get more time out of it, you’re lucky. AND—the more waterlogged it becomes, the harder it is to remove from the tub and the less energy efficient it becomes. Thankfully, a product has been on the market for several years now that saves us from the vinyl cover blight—Smartop. 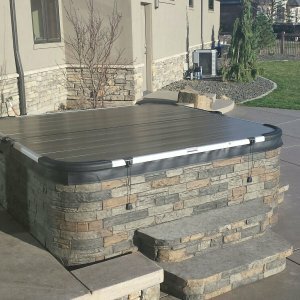 Leisure Concepts, the world’s largest manufacturer of hot tub accessories, went to town and figured out how to eliminate the need for the vinyl hot tub cover. What’s even better for us is that Smartop is made right here in Washington State in Spokane! So terrific to support another Washington owned business in the hot tub industry. The goal of Smartop is simple: Make it the only cover you’ll need for the hot tub for a good long time—up to the life of the tub itself, if possible. Smartop is designed to resist water retention, preventing it from becoming waterlogged. This also means that it will retain its energy efficiency over time unlike its ugly stepsister, the vinyl cover. Leisure Concepts also worked hard to make sure that any component of Smartop that may need attention over time is replaceable. What I love about Smartop is the way it looks. 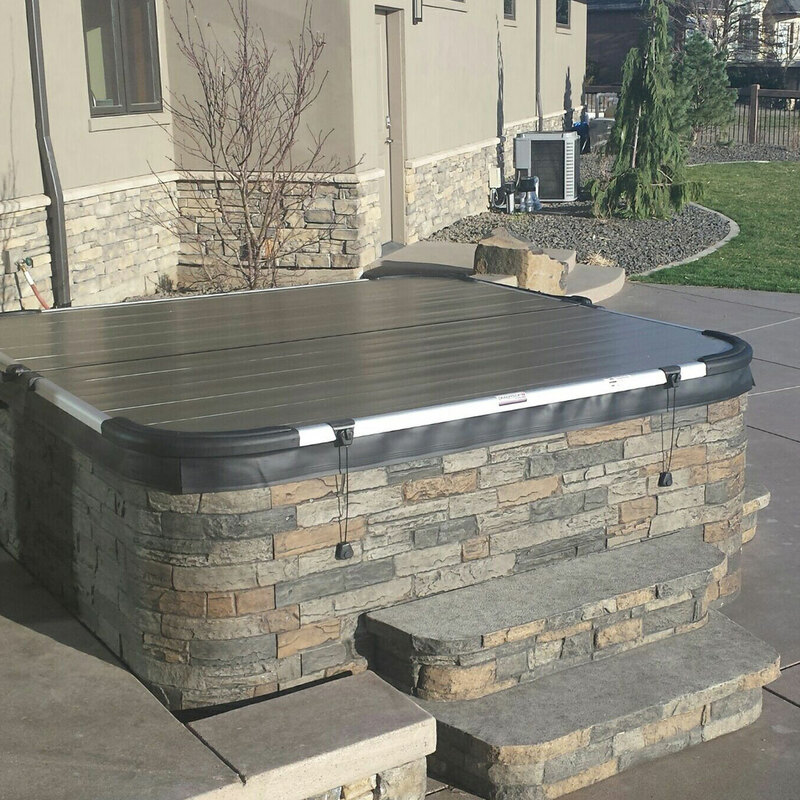 With the deco finish added to it standard this year, it’s truly a beautiful way to top your hot tub. The cover has a luxe high design look. If you’re a visual person like me, you’ll really appreciate the way Smartop will enhance the curb appeal of your hot tub. Integrated cover lifters with hydraulic assist make removing and replacing Smartop on your tub a breeze. Steel cable cover locks allow you to secure the cover when not in use, sealing the Smartop against the bar top of your hot tub to lock the heat in—and make sure folks can’t use your tub when you’re not around. So, when it comes right down to it, Smartop really is just that—smart. If you’re living with a traditional vinyl cover, consider giving Smartop a try! Just like those of us that owned a hot tub for the first time, once you have a Smartop, you’ll never want to have a vinyl cover again!